Playing with Papercrafting: Father's Day Traveler! Many thoughts came to mind when I first saw the new stamp set from our Demonstrator pre-order called Traveler. 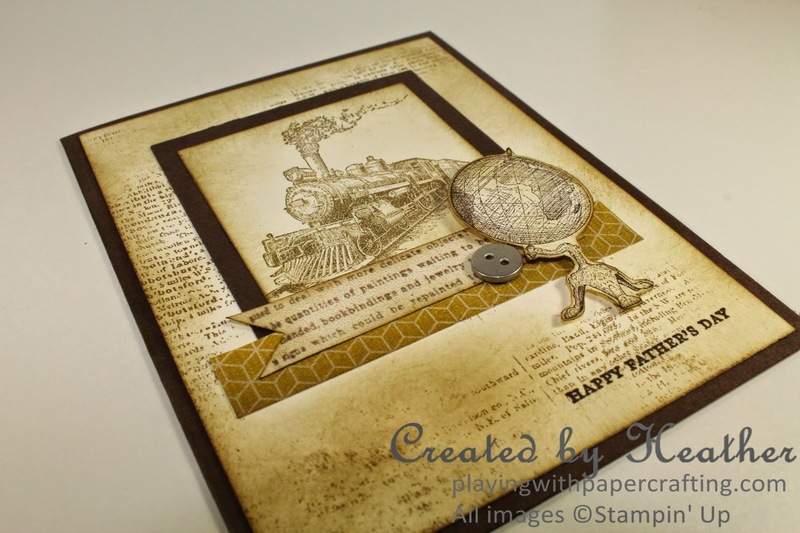 I thought the images, especially the steam locomotive would be perfect for a Father's Day card! There is a romance to rail travel, and more so back in the days of the steam locomotive! 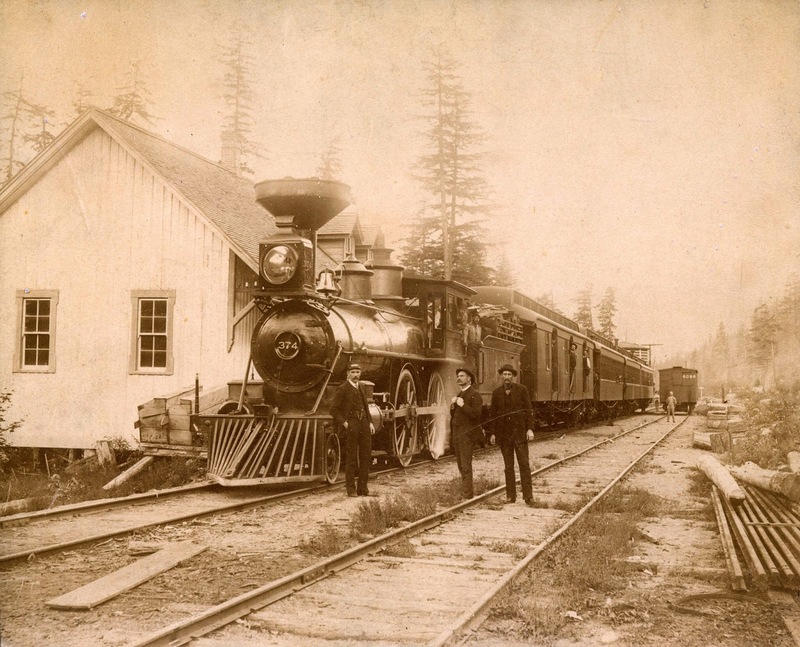 The railroad for many years was the nation's backbone, allowing a country as far flung and diverse as Canada to unite. The railway provided transportation, of course, from coast to coast, which before the steam engine was gruelling, long and dangerous, and very few even attempted it. With the advent of the railway, goods could be transported from one part of the country to the other, sharing the resources from different areas with each other. All along the rail lines, new communities and industries sprang up as their products now had access to a much wider market. I remember travelling by train myself when I was just a child. Of course, it was no longer a steam locomotive ( I'm not THAT old!) but it was so exciting to eat in the dining car and sleep in the berths and watch the beautiful Rocky Mountain scenery go by. I'm not sure if I will enter it or not, because it really doesn't meet the criteria for "clean"! There is too much sponging going on here. I used the Dictionary background stamp, but used it to make a "Whisper" background. Check out the video tutorial for that technique. The sponging adds to the smoky look from the engine, and the vintage feel to the card. The flags across the bottom of the image panel were made from 1/2" strips of Soho Subway paper. By the way, all the current DSP will be retiring, so if you want to get some of it, you only have a couple of weeks left to do it! 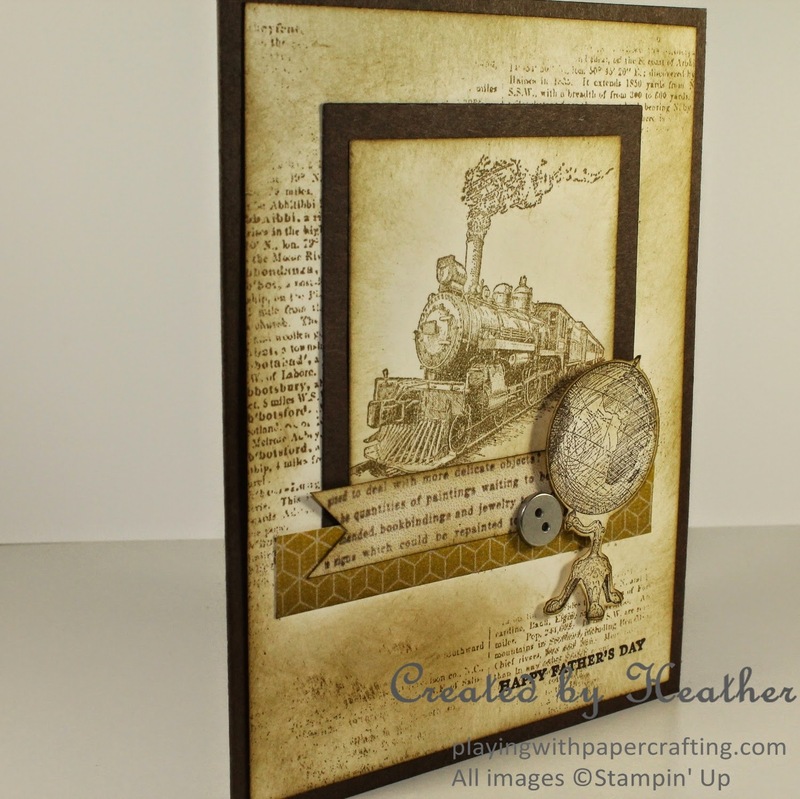 As you can see, the globe which is also from the Traveler stamp set is popped up on Stampin' Dimensionals to make it really stand out, which is important when you are creating a monotone card. The sentiment is from Teeny Tiny Wishes. I've used Early Espresso and Soft Suede here for sponging and stamping. 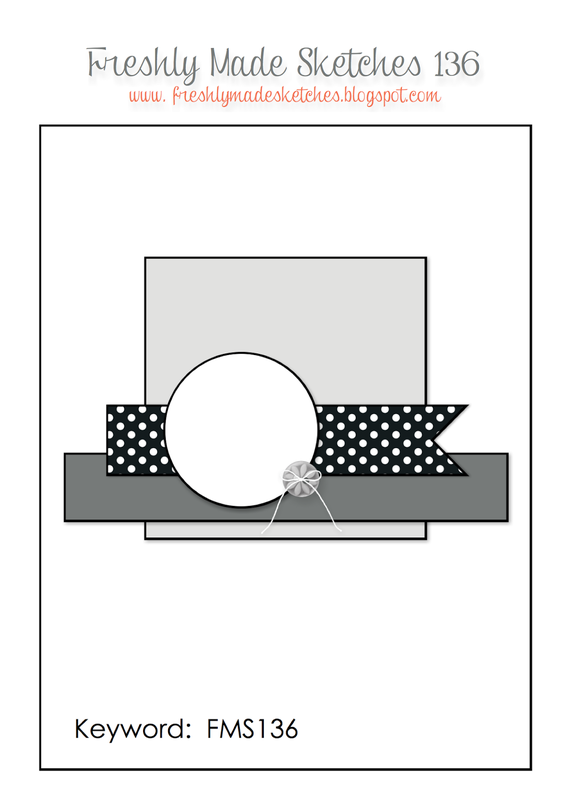 They work well together, and on the Very Vanilla cardstock, they give a vintage look. The little metal button is from Basic Metal Buttons, and adds to the masculine flavour because it is very plain and is made of metal, of course. *Sneak Peek of a new product in the 2014/15 Annual Catalogue, available for order on June 2. **Retiring item, available until June 1, 2014, while supplies last. Really like this one, Mom! The background looks great! Beautiful vintage-style card! 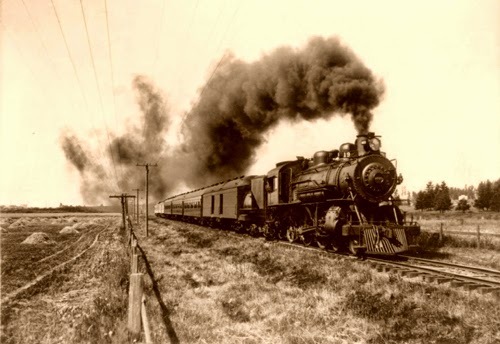 I'll be taking my first train trip this summer -- I love the old pictures you've shared. Thanks for joining us at Freshly Made Sketches this week! This is so fantastic!! perfect masculine card!! Thanks so much, dj! I love making masculine cards. Trop jolis cette carte !